COLOR(S):Gray, red and yellow, red and brown or gray and brown. The Sussex Spaniel is an excellent hunting companion. This is a strong, massive dog. This dog has a golden-liver colored coat that is flat or slightly wavy without being curled. The golden-liver color of its coat, especially at sunset, blends with the color of the trees and game, so hunters using Sussex Spaniels need to be very careful not to shoot their dog accidentally. This may be why the breed is not widespread. They are long and low, rectangular and massive in appearance. Their expression is somber and serious. They have a lower energy level than most spaniels. A good house dog and family pet, Sussex Spaniels are soft and affectionate with a placid outlook on life. 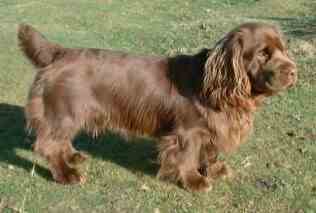 The Sussex Spaniel loves everyone and is sweet, gentle and devoted. He/she is also a good companion dog. These dogs are very sociable, usually get along well with cats and are excellent with children. Most get along with other dogs, but some can be aggressive with unfamiliar dogs. This dog is steady and calm around the house. They are not very outgoing or demonstrative compared to other spaniels, they a lower energy. This dog sometimes bays when it is hunting. The Sussex Spaniel is the only Spaniel that does this. It tends to be less playful and demonstrative than other Spaniels, with a low energy level. They need firm and patient training. It can be snappish if annoyed. This breed has an abundant and flat coat, without a tendency to curl; ample weather-resistant undercoat. The soft medium-length, golden-red coat of the Sussex Spaniel should be brushed and combed regularly. Keep the ears clean and trim excessive hair between the pads on the bottom of the feet, but leave the tuft growing between the toes on the upper part of the feet. This breed is an average shedder. Cardiac and liver problems, hip dysplasia, ingrown eyelashes, invertebral disc syndrome, and otitis externa (earaches). Daily exercise is needed which should include a good walk on leash and the opportunity to play in a yard. Sussex Spaniels enjoy swimming and retrieval games. Sussex Spaniels have a mind of their own, but they are quick learners. Be consistent in your training. Early obedience training and socialization are important. Learning Rate: Medium. Obedience - Low. Problem Solving - Low.